I'm just starting out in Affinity Designer for iPad, and I'm trying to perform a pretty simple fill operation on this eye that I've drawn (see attached). I come from an Illustrator background and it's incredibly simple to do in there. Basically, I've drawn the outer shape of the eye, and added a line through it. I'd like to fill in below that dividing line with one color, and use white above it (as you'd expect for an eye). The problem is, I can't seem to fill in the eye color without creating another complete shape that overlaps the outer shape along the bottom and left sides of the eye. I can work around it like that, but it's tedious and would definitely end up taking forever on more elaborate illustrations. Surely there's some way to fill in color without completely overlapping lines all the time, right? I've not used Illustrator but i assume there is something like a flood fill tool similar to what Serif's Drawplus X8 has that will fill a colour in a bounded area. There is a flood fill tool in Pixel Persona but it only fills Raster outlines. 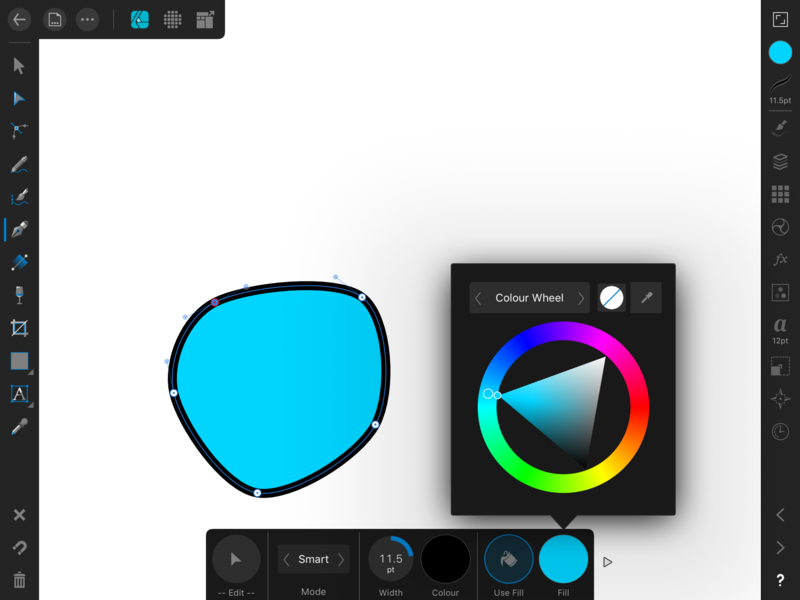 As you mentioned, creating a new vector shape with the colour fill set to the eye colour seems like the only option and editing the nodes to fit the area, time consuming. Another way would be to select the fill colour for the whole shape you already have and use the erase tool in Pixel persona, it's masking out the area but it's a quick way of blocking out the colour, you can use the selection tool to speed up the process. Options include the fill tool or simply select each object layer and fill the vectors with desired colours then position or nest layers to show desired effect.